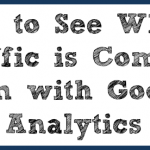 Google Analytics is a very powerful, yet complicated tool. It can be quite overwhelming just logging in and looking at the front page of Analytics. 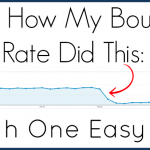 This post will show you how to do something pretty basic – see your top posts in terms of traffic. 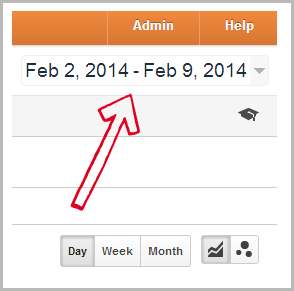 Click the arrow and use the calendar to select the date range that you want. Now, to see the top posts, look over at the long menu going down the left side of the page. Click “behavior” and a new long menu will drop down. 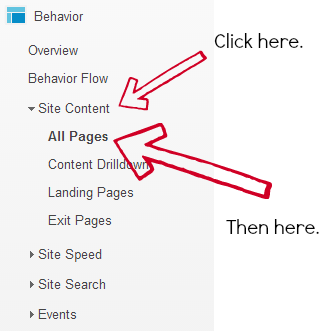 You’ll want to click “site content” then “all pages” to bring up your top pages. You will now see a list of posts and pages from your blog on the main part of the screen. By default, you will be seeing the top pages according to pageviews (the first column with numbers). Where you see the arrows in the pic above, you can click to sort the pages by those options. Included are unique pageviews, average time on page, bounce rate and more. If you’re looking for the most popular page, you’ll want to go by the pageviews column. The lone slash is your homepage. The /page2, /page3 and beyond are when people scroll down to the end of you homepage and click “older posts” or “next”. The content on /page2 etc is always changing, so it’s not the best representation of who is seeing what. 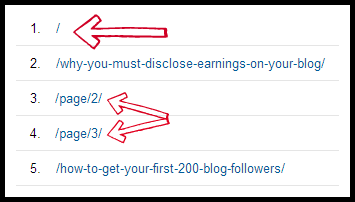 It just tells you that people are browsing through your blog, which isn’t a bad thing! You are not limited to the top 10 posts here either. There are little arrows at the bottom right where you can scroll through all the way to your least popular post. Knowing which posts are the most popular can be beneficial for many reasons. 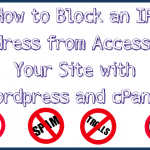 Perhaps you didn’t even know that a post from 2 years ago was still getting a lot of traffic. 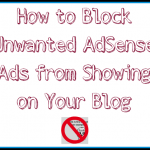 Maybe it might be good to add an email subscription box to the post, or an AdSense ad. 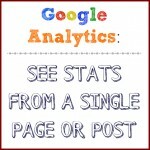 Another good reason to know which posts are popular is so that you have a good grasp on what is working when it comes to your site. 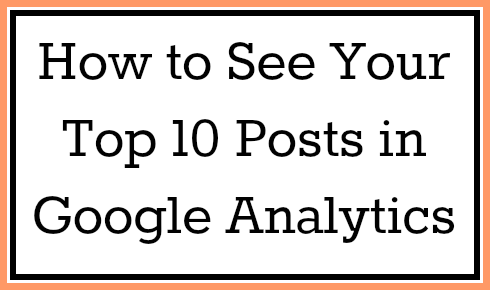 You want to write about what people want to read, so pay attention to your top posts! Are you surprised to see certain posts on your top 10? Thank you so much! I have been wracking my brain on analytics trying to figure this information out. No problem! Glad to have helped!